The Citroën 2CV or deux chevaux is essentially France’s version of the Volkswagen Beetle, and was very surprised to find one at work yesterday morning. I’m not sure where it came from, but it definitely looked out of place parked among the late model sedans. I wish I had my camera with me; the above photo is of a 2CV I saw in Paris awhile back. The 2CV is a “people’s car.” Like the Beetle, Fiat 500, and Mini, it provided basic but economical transportation and helped mobilize a nation. It’s also a cultural icon and boasts one of the longest production runs of any car. 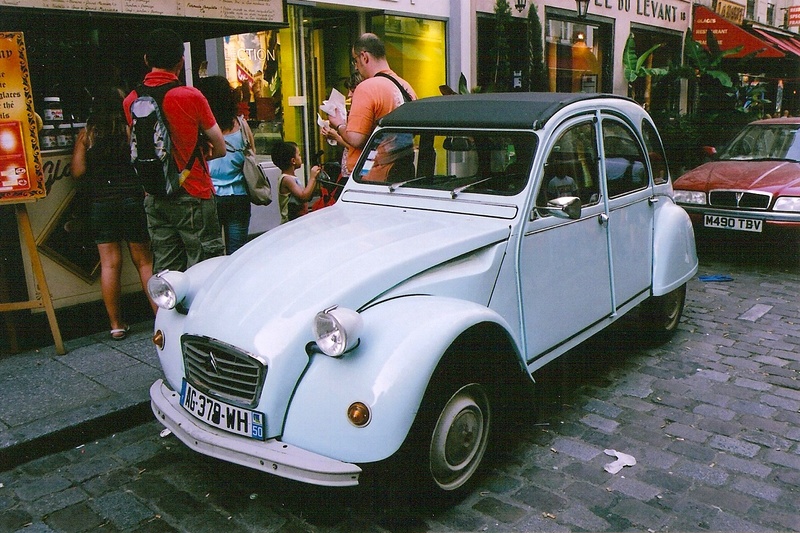 The last 2CV rolled off the assembly line in 1990, after 42 years of production. That puts it in the same club as the original Mini, which was produced from 1959 to 2000, and the Beetle, which was produced from 1938 to 2003. Considering that most cars are redesigned after four years, these people’s cars’ long lives are very impressive. Key to the 2CV’s longevity was its simplicity. It featured a small engine that was easy to work on, rugged suspension for dealing with less-than-optimal road conditions, and front-wheel drive for better traction. Durability was the 2CV’s only real positive quality, though. The engine and suspension may have helped mobilize French farmers after World War II, but they could not provide enjoyable performance or handling. “Comfort” was not on the list of priorities either. As its styling makes abundantly, clear, the 2CV is a car from another time. It was designed for a world that viewed cars as tools, not lifestyle accessories. Whereas car designers today try to model their products on smartphones, Citroën’s designers looked to the cockroach for inspiration. Today’s Western buyers can’t tolerate a car as unrefined (or, it has to be said, as unsafe) as a 2CV, which shows just how far technology has progressed since 1949. It’s just too bad that new cars aren’t as bulletproof as this French wonder. “Car companies will go to an awful lot of trouble to avoid dealing with the United Auto Workers Union,” Jamie Kitman declared in a recent Automobile column. Volkswagen’s new factory in Chattanooga, Tennessee is not only far from the UAW’s Detroit stronghold, it’s also near a sewage treatment plant that makes the city stink during periods of light rainfall. Still, With its new factory and plans to build cars for Americans with American labor, Volkswagen seems like a corporation sent by central casting to confirm the right wing rhetoric of “job creators” and laissez-faire economic policies. However, the truth, as Kitman points out, is never that rosy. The corporate set will always put money first, and the American people should realize this before they entrust the private sector with their future. If Volkswagen can pull its Americanization strategy off, it will be a marketing coup. The car company founded by Adolf Hitler was always among the most foreign of foreign carmakers in the American market. To shed this image, VW tailored the new Passat to ‘murican tastes: it is bigger and simpler than the outgoing model, with a softer ride and duller handling. It also has a bigger optional engine than its predecessor, although it is less efficient. In short, the new Passat is less like a European sports sedan and more like the car most Americans buy: the Toyota Camry. The new car may seem inferior, but so what? Volkswagen is finally speaking our language, complete with a hillbilly twang. More importantly, the plant that builds the Passat will employ thousands. That, however, comes with a caveat. Volkswagen followed Toyota’s lead in more ways than one. In addition to tailoring products for the American market, they have made sure to place their factories out of the reach of unions. Detroit may be the home of the American automobile, but the Deep South is the home of the Asian automobile. Nissan has three plants in the South: two in Tennessee, and one in Canton, Mississippi. Hyundai has a factory in Alabama, and its subsidiary Kia has one in Georgia. Toyota has five assembly plants spread across the U.S., in Alabama, Kentucky, Indiana, Texas, and West Virginia; another plant in Mississippi will open soon. All this means that, yes, people in rural areas have easier access to work. It also means that management can turn the tables on these workers any time they want. A few years ago, when General Motors was facing bankruptcy, critics blamed the UAW for its inflexibility. It wasn’t just idle union-bashing: the Japanese and Korean carmakers made significant cuts to production costs by offering fewer benefits. It’s a good way to do business, but is it the American way? 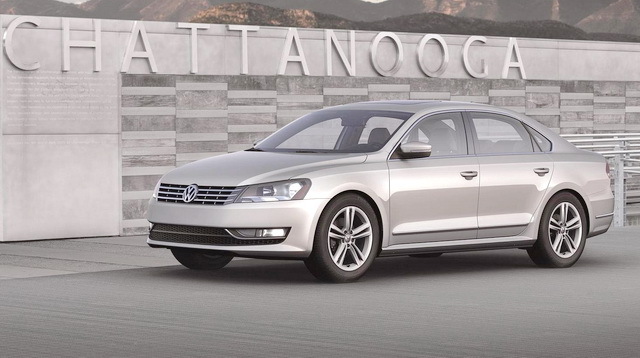 Volkswagen may have had other reasons for building its factory amid the sewage fumes of Chattanooga, but the main benefit will probably be the more malleable Tennessee workforce. Many Americans are desperate for work right now, but they need to think about whether they can live with said job for the rest of their lives. Politicians may not seem interested in helping average people, but at least the law obligates them to serve those people. The big wigs at VW’s corporate headquarters are only obligated to serve the bottom line.